A cruiser for riders looking to have an early morning butter conference learning the fundamentals. Super smooth responsiveness, whether you are linking your first turns or just enjoy the overall universal freeride sensation. 2.2"/2.2"/2.3" Continuous Rocker - a smooth, stable pop off the wake every time. Rounded-End Profile - gives this board a precision edge-to-edge flowing ride. "V" Bottom Full-Length Tunnel - breaks up the water on landings and aids tracking. 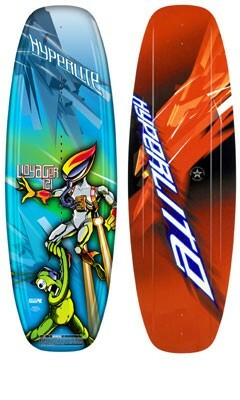 Two 2.0" Poly-Cleaver Fins - these fins have more surface area in the back for a "grippier" feel. 4.75" Center Fin Placement - for a quicker release off the wake and an overall "floatier" feel. 3 Degree Perimeter Bevel - provides a generous margin for error.